Luxury and Excellence: A commitment renewed by Grand Velas Riviera Maya. 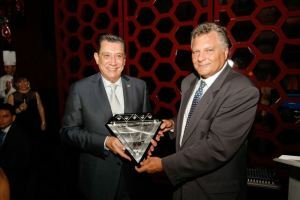 Upon presenting the Five Diamond Award for the second consecutive year, National Director of the AAA Tony Perrone declared that Grand Velas in the Riviera Maya has created new standards for obtaining this coveted recognition. Only 0.25% of the estimated 60,000 sites visited year after year by the American Automobile Association (AAA), are named on their elite list of Five Diamond properties. High standards in quality, world-class service, lighting and impeccable architecture, as well as prime facilities, are elements evaluated by the AAA in their selection of the most highly rated establishments. With just three years since its opening, the resort has received the applause of various authorities in the hotel sector including Virtuoso, The Leading Hotels of the World, The Leading Spas of the World and Condé Nast. Learn more about this resort and its culinary tour, world-class Spa and renowned Luxury All-Inclusive plan.